Dynamic paint is a modifier and physics system that can turn objects into paint canvases and brushes, creating vertex colors, image sequences or displacement. This makes many effects possible like, for example footsteps in the snow, raindrops that make the ground wet, paint that sticks to walls, or objects that gradually freeze. 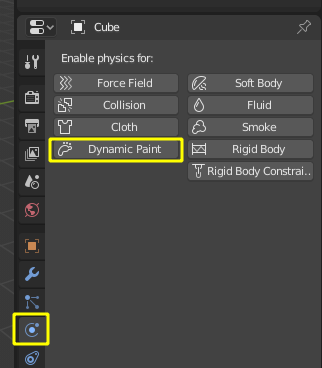 Dynamic Paint can be activated from the "Physics" tab of the "Properties" editor. Modifier itself has two different types Canvas and Brush. You can also enable brush and canvas simultaneously. In that case same object's "brush" does not influence its "canvas", but can still interact with other objects in the scene. A detailed guide that covers every setting with images and examples (currently not up-to-date).